Aimed at those who work at a non-profit society in British Columbia or sit on a board of directors, Transitioning an Existing Society: A How-to Guide for Non-profits in BC covers the steps in transitioning a society under the new Societies Act. 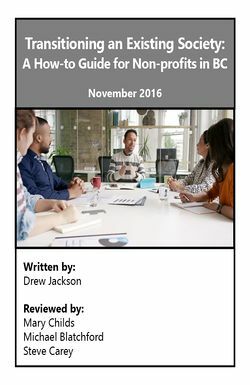 This how-to guide for BC non-profits was written by Drew Jackson, a lawyer and librarian who writes about law for the public, and reviewed for legal accuracy by three British Columbia lawyers who advise non-profit societies. Transitioning an Existing Society: A How-to Guide for Non-profits in BC © Drew Jackson is licensed under a Creative Commons Attribution-NonCommercial-ShareAlike 2.5 Canada Licence. The information is produced for educational purposes and is not intended as legal advice. If you need advice about a specific legal problem, please contact a legal professional. Some sources of legal help are highlighted in the "Further Help" section. This page was last edited on 5 December 2016, at 10:50.